The Dimensional Chest Trap is a Tactical weapon. This immaculate chest is the last thing from this world that a greedy mouse will see. If an opponent ventures too closely the chest will spring to life and be upon them, opening itself to another dimension and pulling the mouse within. The Dimensional Chest Trap can be purchased for 1,200,000 gold plus 175 Flameshards from the Muridae Market Trapsmith after it is rebuilt. The weapon refunds for 216,000 gold at the same location. The 1 Warpath Victory requirement for purchase is also a requirement for entering Muridae Market, so Hunters who can access the Trapsmith will have met this requirement. 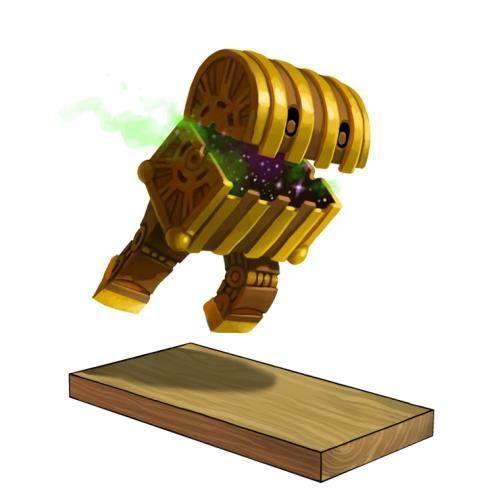 2 June 2011: The Dimensional Chest Trap is released. This page was last edited on 13 January 2019, at 15:44.